Band Compatible with Apple Watch: compatible with iwatch series 4 40mm and 44mm, 12 printing patterns for choice. 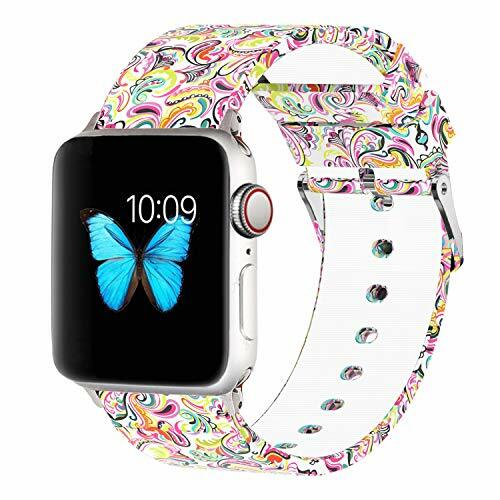 Fashionable and Stylish: colorful floral patterns give your iwatch a unique outlook,makes it stylish and outstanding, perfect for daily wearing, sporting and parties. Premium Quality Material: made of food grade soft silicone, comfortable, safe and durable; metal buckle at the end of the band can help you adjust the size freely; comes with Lugs on both sides, which lock onto iwatch precisely and securely. Compatible Wrist Circumference: 40mm band fit for 150mm-215mm (5.90\"-8.46\") wrist, 44mm band fit for 155mm-220mm (6.10\"-8.66\") wrist. Case matches with our printed band, will give your watch an unique outlook.